The subject of this year’s symposium is Exeter Cathedral. To be held at Petroc College, Tiverton on Saturday 5 October, and hosted by our 2019–20 President John Allan. 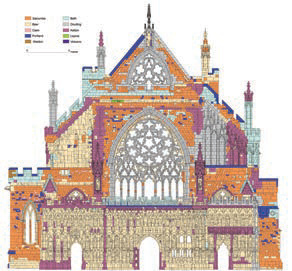 Nowadays, after many generations of study, the international importance of Exeter Cathedral is widely appreciated, but it might be thought that such a richly documented and intensively-studied building has received so much attention that there is little fresh to say about it. In fact the opposite is the case: a remarkable range of scholars in Britain and abroad continue to make exciting progress in understanding this familiar structure. The symposium will present five papers illustrating a range of current work on historical aspects of the building, its artistic connections, monuments, patrons and music. The cathedral is also, of course, a living community and in the afternoon session we will look at aspects of its modern life, focussing on its traditional masoncraft and the care of its outstanding library and archive. For members of the DA the price of a ticket is £25. For non-members £35. You can now purchase tickets for the Symposium online via WebCollect. For details, go to our booking page. For applications by post, a booking form is included in the Spring issue of our DA News magazine; alternatively a printable copy of the form can be downloaded here.